The product of a monstrous alien symbiote bonding with a human host, Venom is a powerful supervillain. 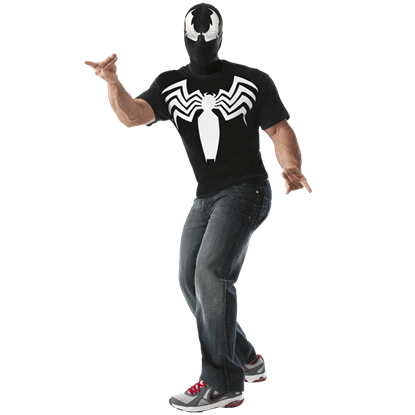 When you combine with the Adult Deluxe Venom Costume, you may find yourself transforming into the nightmarish creature yourself. 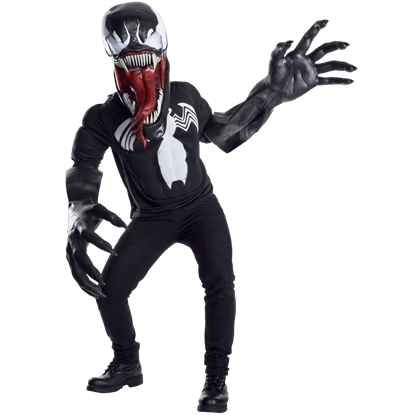 With horrific, larger-than-life details, the Adult Venom Costume is sure to astonish at your next costumed event. This set includes a terrifying Venom mask, a pair of oversized gloves, and a long sleeve, padded Venom costume shirt. The Venom alien symbiote was originally conceived as a supervillain but has since become more of an antihero. It requires a human host to survive. 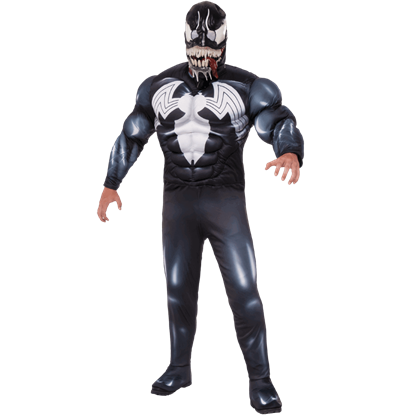 Wear this Adult Venom Costume Top and Mask for Halloween or to any costumed event. You would think Venoms jaw would get tired from all that hyperextension. 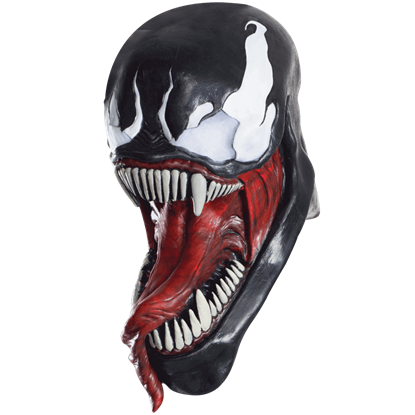 The Adult Venom Latex Mask features the visage of this frightening alien symbiote in all its gruesome detail, right down to its realistic webs of drool. Every superhero has a slew of archenemies, and one of the most well-known for your friendly neighborhood Spiderman is the sinister symbiote Venom. 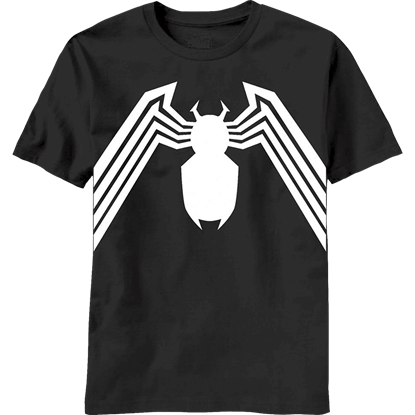 The Classic Venom Suit T-Shirt features the design from the suit this villain wears. 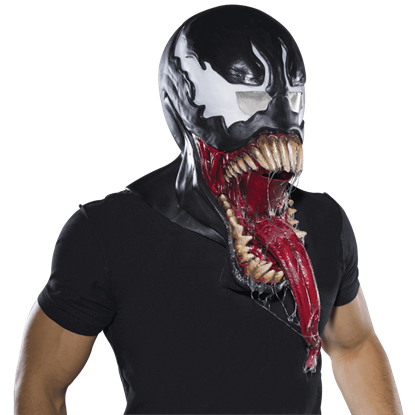 Venom is one alien symbiote you would not want to meet in a dark alley, and the Deluxe Venom Latex Mask portrays this Marvel character with terrifyingly realistic detail, right down to its multitudinous fangs and wicked tongue. Flash Thompson, decorated Iraq War hero and former classmate of Peter Parker, becomes the host of the Venom symbiote, after which he is then known as Agent Venom. 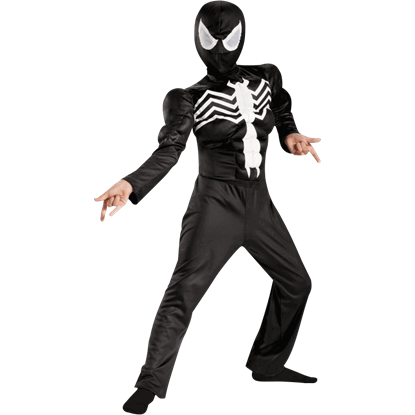 Your child will love the Kids Deluxe Agent Venom Muscle Costume. If your kids like the darker side of the superhero world, they are sure to enjoy dressing as the evil symbiote, Venom. 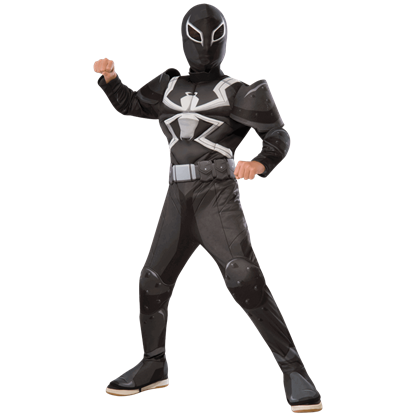 The Kids Deluxe Spider-Man Venom Costume displays the dark suit worn as Venom bonds to and takes over Peter Parker. Do your kids like to choose their good and evil days? 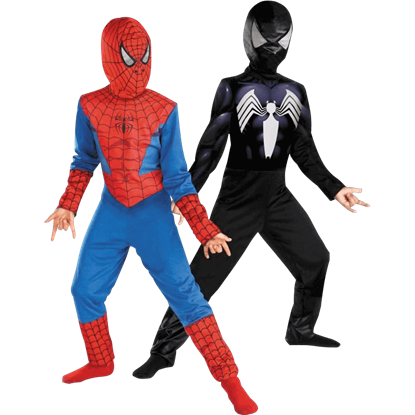 Thanks to the Kids Reversible Ultimate Spider-Man Costume, your young superheroes can have both looks. This costume offers the classic Spider-Man and evil Venom symbiote looks. 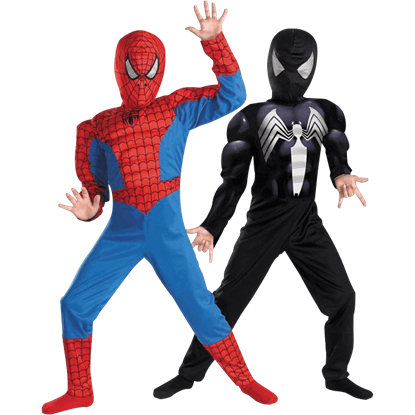 The Kids Reversible Ultimate Spider-Man Muscle Costume comes with a big choice. Will you wear the traditional red and blue Spider-Man costume and fight evil in your city? Or will you choose to let the darkness take you in? 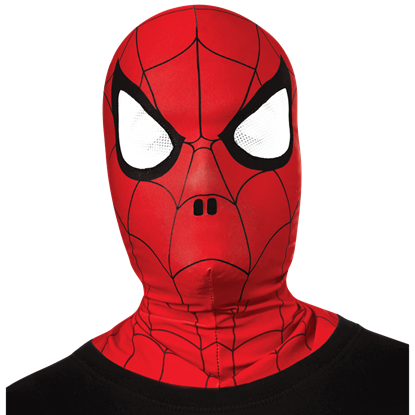 Your child will love dressing up as a friendly neighborhood Spider-Man with this Kids Spider-Man Fabric Overhead Mask. Featuring velcro closure and mesh-covered eye openings, this mask will keep your web walkers identity a secret. Does the darker side of the superhero world appeal to your kids? If so, then they will be sure to enjoy dressing as the evil symbiote, Venom, for Halloween! 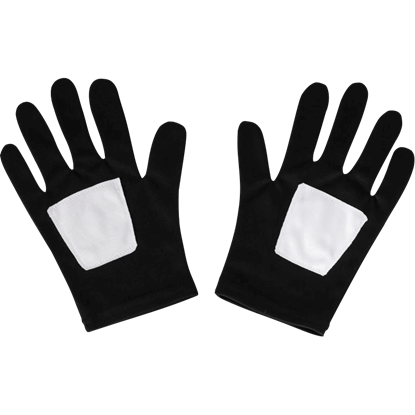 The Kids Spider-Man Venom Gloves provide the perfect detail for their outfit.